Before the mid-80s and late 70s, quilting in Canada was very much a one-woman hobby. Women would make quilts, quilt them individually or bring them to groups that had floor racks set up for quilting bees, generally in church halls or basements. After American’s Bicentennial in 1976, there was an explosion in the quilting world. Suddenly there were magazines, books, shows, quilt stores, quilting fabric, instructions and tools available and every woman interested in sewing and needlework jumped on the bandwagon. In 1985, Joan O’Neill moved to Picton, having spent the previous 14 years in the Toronto area professionally arranging Art & Craft shows. She had made quilts for years and belonged to two guilds, Rouge Valley and Scarborough. The County was exactly in the one-woman hobby syndrome and Joan was itching to start a guild. Ruth Geary belonged to the group of quilters at the Lake-on-the-Mountain Church and was eager to join in. Unfortunately she died two years later in 1988. Margaret Kerr lived on Big Island and was a self-taught quilter. Her husband had a serious stroke which affected his mobility leaving him house-bound for 18 years, which also left Margaret in the same situation. Last but not least, Mary-Lou Norton joined. She was president of the Women’s Institute in Bloomfield and also the area representative for the Institute for the Quinte Region. 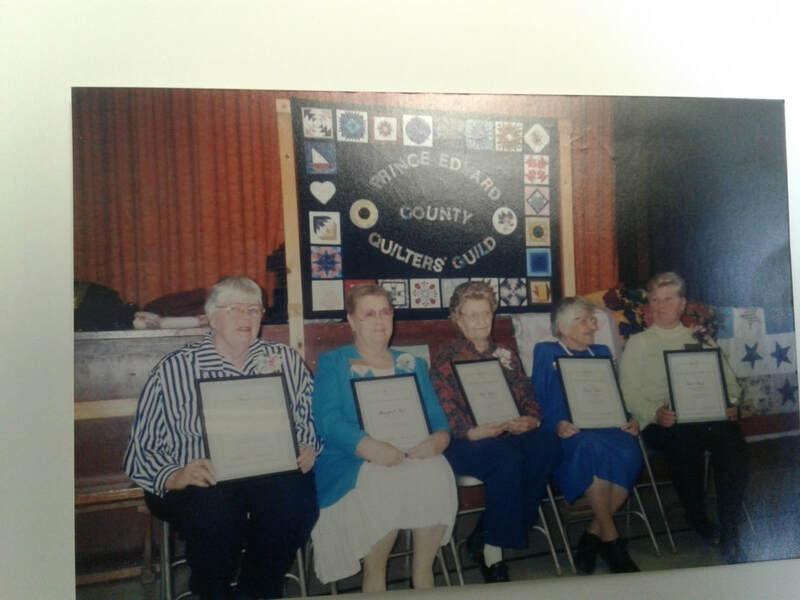 These six women, under Joan O’Neill’s tutelage, started the Prince Edward County Quilt Guild and through Mary-Lou’s connection with the Women’s Institute, several women were brought into the fold and in no time the group consisted of 15-20 women. Mary-Lou was a valuable addition to the group, for while Joan had the vision, Mary-Lou was the executioner. She was an organizer that got things done and at her suggestion they called themselves “The Prince Edward County Quilters’ Guild” and Mary-Lou was named president. She opened a competition for the members to design a logo for the guild. The members voted on the entries and the winner was Jackie Adams, whose logo we still have today. Initially the quilters met at Joan’s house, but as the group grew, other facilities were needed and so they moved to The Edu-Centre on Stanley Street, Bloomfield, across from the Baxter Centre. Later, as the group further grew they moved to Pinecrest School, Bloomfield, first in the library and later in the gym. This arrangement lasted until 2016, when the guild moved to Bethany Christian Reformed Church, Bloomfield where we are today. Our first three quit shows were annual, after 1990 they became biennial. The Guild was started in 1986 by Joan O’Neill and five other women, one of whom was Mary-Lou Norton, who became the Guild’s first president and Quilt Show Chair. Mary-Lou was a formidable, no-nonsense woman, a great organizer who did not suffer fools easily. She always reminded me of the school teachers I had in the 30s, when children stood at attention when the teacher spoke. There is an old Viking saying when referring to someone who not only is strong-willed but is also able to transfer his will onto others: “You wouldn’t want to bite spoons with him.” I have no idea of the origin of this saying - did the old Vikings have spoon biting contests? Were they tin spoons or wooden spoons? - I don’t know, but everybody understood the meaning of the saying. Mary-Lou was that kind of person. 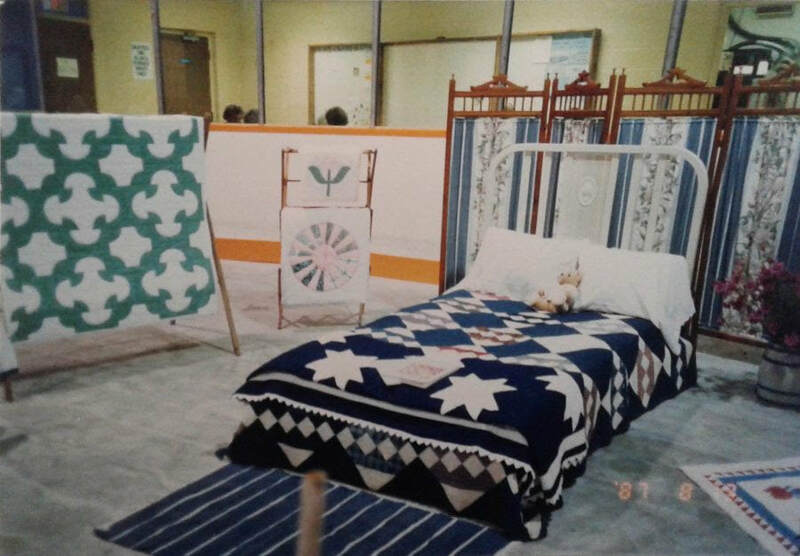 Mary Lou wanted a quilt show in 1988 whether the Guild was ready or not, and so the Guild had one. And accordingly, the Picton Arena was rented. Compared to today's elaborate display, the show was simple and sparse and rather pathetic. We had a very limited amount of quilts. The guild was still in its infancy at only 20-25 members and not yet a cohesive group. We had no racks. Quilts were draped over the arena boards, chairs and tables used as props were provided by the members. Quilts were even laid out on the arena floor. It was truly a learning experience. Mary-Lou is still president and Quilt Show Chair. At her insistence we would have a second show, even though the Guild only had about 25-30 members and not enough quilts. quilts, which in turn were displayed in groups representing their respective townships: Athol, Hallowell, Ameliasburgh, South and North Marysburgh etc., etc. were also strung across the arena. Rather amateurish and certainly not professional. Dot Stevenson is elected President and Quilt Show Chair. By then the Guild was 35-40 members. Dot was also an organizer who got things done, but with a much softer approach and her first agenda item for the show was racks, racks and racks. Dot had seen a picture of an American show where displays were on wooden racks, a picture clear enough to ascertain the construction of the rack. She involved her husband Frank and her uncle and they made the first lot of racks. What a successful element to the show, which went from amateur to professional and also resulted in quite a few new members joining the Guild.